What do you guys think? Do you agree? Do you get their point? Do you disagree? I for one HATED seeing this post on my timeline. I literally scrolled past it, read the caption and had to take a deep sigh & shake my head (which I think may just be the universal signal of disappointment). 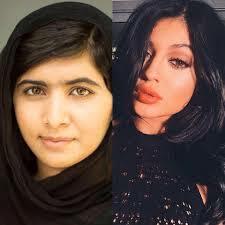 You see I get the support for Malala. She is an amazing, inspiring woman who was faced with horrific situations and her strength and courage is definitely something that should be celebrated. But should it be celebrated with a comparison to another women's achievements (or lack of?). 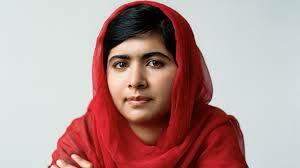 Malala Yousafzai is celebrated. I know who she is. I’ve read her story. I’ve watched documentaries and interviews about her. Her story is being covered, just not in the same places as where Kylie’s story is. I know Kylie’s story too. I’ve grown up watching the Kardashians (& every other spin off). I follow them all on social media and love to see what’s new in their lives. Stories of both these women’s lives are played out in the media, but just differently – because they are different people who should not be compared. Posting a side by side comparison of the two women seems pretty redundant. For a post on Facebook that wants to be seen as positive, motivational and empowering all I see are some people trying to praise the efforts and achievements of one human being by insulting and downgrading that of others. The thing I noticed once I searched the hashtag was that the majority of people sharing the post were also women. How does this make sense? How does pitting two young women against each other in a bid to demonstrate one is better than the other lead to anything positive? Isn’t this the problem? Isn’t this what women regularly argue with men against? I’ve noticed it happens more and more BETWEEN women rather than AGAINST them. As women we may all face different forms of oppression or sexism over our lifetime, some may be more open and overt while others may be deep routed into our social systems and harder to identify, but nevertheless they may still exist. It happens a lot in society and I cannot stand it. 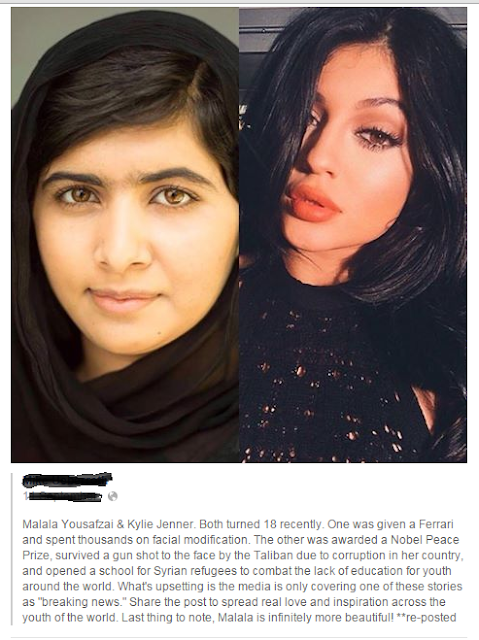 Why can’t we celebrate the amazing work Malala has done before she’s even hit 18 without saying another person, who just so happens share the same age and gender, isn’t as good at her? Listen go on to Daily Mail, E! Online, Perez Hilton’s Website etc. Just expect to find at least a handful of new articles about the glamourous life of the Kardashians. This is what the audiences of these sites want. So this is what the audience of their site get. Jenner is a product of our culture. We consume her then turn around and judge her for it. But go on to BBC. I could be wrong here but I don’t ever remember seeing any post about Kylie’s Birthday hit headline news. I don’t think the news presenters on ITV Evening News or BBC Breakfast were speaking about that amazing Ferrari she got given by Tyga. But I have heard of Malala through these outlets. I’m pretty much sure that’s where I first heard her name and story. So I don't know where these people are getting their "Hot Topics" (word to Wendy Williams) from but I'm sure this will have a huge impact on what's "Breaking News" for them. Let's be honest, turning 18 isn't something news worthy that Malala has done, yet her winning the Nobel Peace Prize & opening a girl's school is - and it was. Yet, Kylie Jenner is a reality star. She is famous due to her existence so it makes sense for her big 18th Birthday bash to be viewed and read about by millions. In 2014, Malala became the youngest person to ever receive a Nobel Peace Prize and went on to open an all girls school in Pakistan. She survived a vicious shooting and now fights for equal education for both men and women and has become an advocate in her own right. 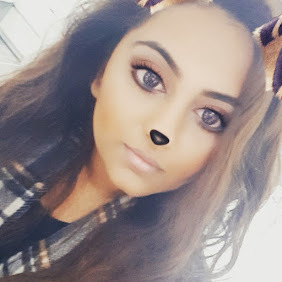 Amazingly, she witnessed disadvantage and injustice in her society and instead of turning the other cheek and conforming she decided to take a stand against it and give women a voice. The media treat both women differently - as they should as they are different people. You wouldn't catch a journalist asking Malala about her latest boyfriend and tabloid rumors, so similarly you won't catch the same headline news when both turn 18. 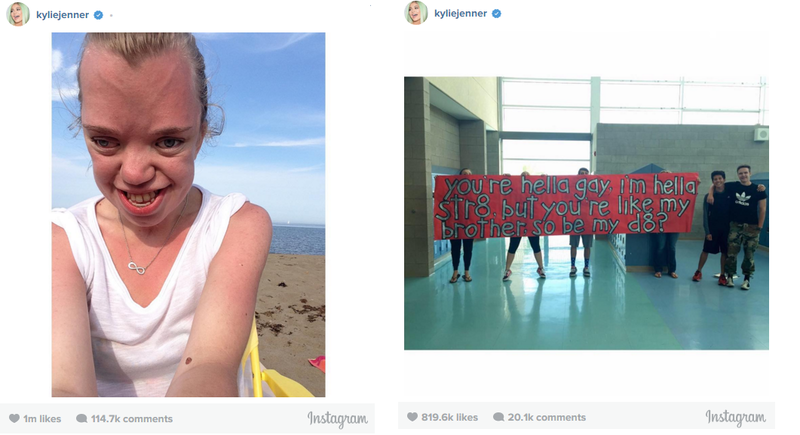 So while we are on the topic of the media, if you are one of Kylie’s 40.5 Million Instagram followers you may have seen a recent campaign she started called “IAmMoreThan..” this celebrates the lives of people who may be deemed “different” by society. But did these Facebook posters choose to focus on that? Instead they are focusing on what the media fails to show whilst being selective themselves. The fact is she is using her huge following and influence to try and make a change in society and give people a voice. Her means may have been different to Malala but she is in a totally different situation and as a woman has experienced something different – but at the end of the day she is a “normal” 18 year old, living her life – SO LET HER LIVE. 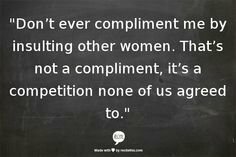 So women, instead of insulting each other to rise to the top – stick together. Support each other. Take time to try to understand each other’s struggles. It starts with us. The hilarious thing is Malala was attacked and opposed specifically because of challenging the female stereotypes of her society. Her society presented the view that women should not go to school, they shouldn’t build a career – they should stay home and be housewives. But by shaming Kylie for getting plastic surgery, spending loads of money and sexualising herself aren’t you opposing her for challenging our society's female stereotype of being conservative, natural and modest? Don’t people just understand as much as they may share the same year of birth they are very different women, from different life backgrounds, faced with different obstacles and difficulties? Is there even a comparison to be made between them apart from the fact they are the same age? Both women are making a life for themselves. They occupy very different positions in our cultural landscape. Whether you agree with the means they are going about their lives or not, remember they are both young women in the media flash-point. I found this to be an interesting read and I do agree women need to stop pitting themselves against each other. Both women are subverting their social stereotype yet one is being judged for it while the other is celebrated. Thank you for sharing this post, fantastic writing style.